Objective: Remodel a 1960’s tract home to suit the living needs of a family with three teenagers. Results: Located in a quiet canyon, the home was purchased as-is. the original kitchen with a 7’ ceiling was too confining for this active family. We created a vaulted ceiling in the kitchen by incorporating an inaccessible attic. 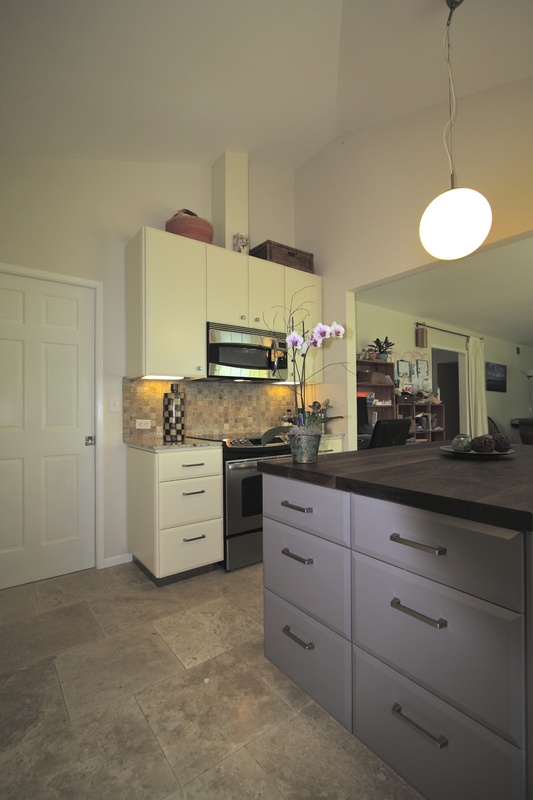 Cabinets were custom built by Artistic Freedom Designs, a local green cabinet shop. All wood is FSC certified and is finished with water based lacquer, and the island was topped with FSC walnut finished with hand-rubbed, food-grade, organic linseed oil. The remodel consisted of every room: new baths, kitchen, flooring, reconfiguring some of the rooms and using eco-friendly products throughout with warm color tones to replace the original, colder blues and whites. Blue carpeting on the main floor was replaced with 18x18 travertine, and the upstairs features vertical bamboo. After: We created a vaulted ceiling by incorporating an unaccessible attic over the kitchen. Before: Small kitchen with 7 foot ceiling height. All cabinets and finishes were original 1960’s. All cabinetry was custom built by Artistic Freedom Designs, a local green cabinet shop. All wood is FSC certified and is finished with water based lacquer. Island with FSC walnut top finished with hand rubbed food grade organic linseed oil. Before: Looking toward northwest corner. After: Looking toward northwest corner. Kitchen design, material and color consulting on the project by Boatman Design. Cabinets feature many pull out drawers with soft close hardware. Before: All walls were white and floors were blue. Open area at top of stairs will be closed to create quiet office retreat space. After: Note glass door and wall creating quiet second floor office. Before: Original brick fireplace, blue carpeting was throughout the house. 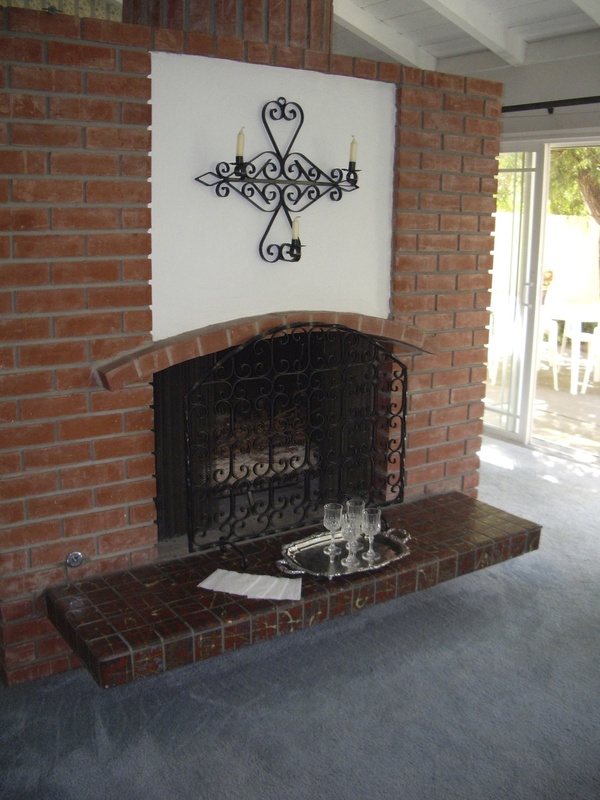 After: The only change to the fireplace was painting the white stucco. Note the great round chimney. All flooring on first floor is 18x18 travertine. 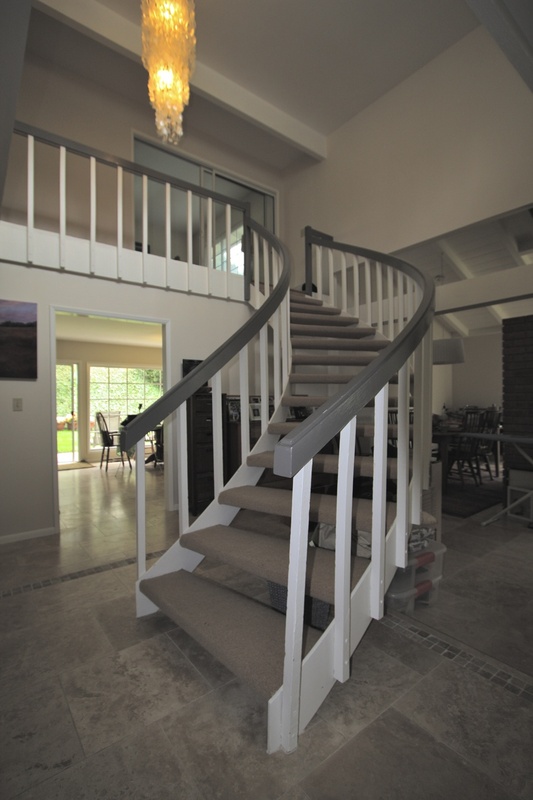 Original stairway of welded steel and bent wood handrail. All flooring in second floor bedrooms and office is vertical bamboo. Dining room with pocket door to kitchen. Plank and bean ceiling was caulked, puttied and painted and looks better than when it was new.